The Future of Pension Management offers a progress report from the field, using actual case studies from around the world. In the mid-70s, Peter Drucker predicted that demographic dynamics would eventually turn pensions into a major societal issue; in 2007, author Keith Ambachsheer's book Pension Revolution laid out the ways in which Drucker's predictions had come to pass. This book provides a fresh look at the situation on the ground, and details the encouraging changes that have taken place in pension management concepts and practices. The challenges identified in 2007 are being addressed, and this report shows how design, management, and investment innovation have led to measurably better pension outcomes. Pensions have become an everyday news item, and people are rightly concerned about the security of their retirement in light of recent pension scandals and the global financial crisis. This book provides a note of encouragement, detailing the ways in which today's pensions are becoming more and more secure, and the new ideas and practices that are chipping away at the challenges. Drucker's vision of a needed pension revolution is unfolding in real time. Better pension designs, more effective pension governance, and more productive pension investing are mitigating many of the issues that threatened collapse. The Future of Pension Management provides a real-world update on the state of pensions today and a look forward to the changes we still need to make. 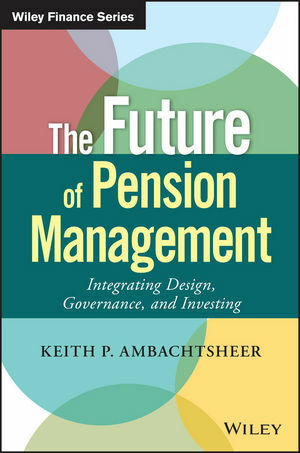 KEITH P. AMBACHTSHEER is Director Emeritus of the International Centre for Pension Management at the Rotman School of Management, University of Toronto, and President of KPA Advisory Services, which provides strategic advice to a global clientele of pension and investment organizations. He is the author of three bestselling books and has been a regular contributor to industry journals since the 1970s.